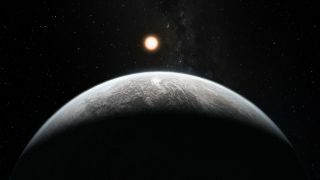 A super-Earth basks in the glow of its star in this artist's impression. Is the world habitable and Earth-like with a watery atmosphere, or is it Neptune-esque, swathed in hydrogen and helium? Perhaps the most intriguing exoplanets found so far are those bigger than our rocky, oceanic Earth but smaller than cold, gas-shrouded Uranus and Neptune. This mysterious class of in-between planets —alternatively dubbed super-Earthsor mini-Neptunes — confounds scientists because nothing like them exists as a basis for comparison in our solar system. "We don't really know what they are," said Björn Benneke, a graduate student in astronomy at the Massachusetts Institute of Technology. "They can be a scaled-down version of the giant planets in our solar system, a scaled-up version of terrestrial planets like Earth or something completely different." Crucially, the discernment between mini-Neptunes and super-Earths as proposed by Benneke can be done with available telescopes. Astronomers and the public will therefore not have to wait until next-generation instruments such as NASA's James Webb Space Telescope come online later this decade. Benneke's concept for characterizing atmospheres relies on planetary transits, which is when an exoplanet crosses in front of the star as seen from Earth and blocks some of the star light during this transit. NASA's Kepler mission has looked at more than 150,000 stars for this slight dimming effect that reveals the presence of planets and some of their basic properties. Other space telescopes, such as Hubble and the Spitzer Space Telescope, also make use of this technique. When a transit occurs, starlight shines through the exoplanet's atmosphere. Different wavelengths of light preferentially pass through this atmosphere based on its composition, thickness, cloud content and so on. By simultaneously measuring how much the star becomes fainter during the planet's transit at different wavelengths, the general extent of the planet's atmosphere and by extension its chemical character can be inferred. Fortunately, visualizing the data can help. When the transmission spectrum is plotted on a graph, the steepness of the absorption features can be a tell-tale sign of the amount of the atmosphere's constituents. "When graphed, the spectrum of water-rich atmosphere appears wavier, but hydrogen-rich atmosphere show more distinct and spiky signatures," said Benneke. "This difference is unambiguous." Effectively, the technique can be used to measure the average mass of the molecules in the exoplanet's atmosphere. And conveniently for the purposes of distinguishing a hydrogen-dominated atmosphere from a watery one, say, the molecular masses are strikingly different. GJ 1214b stands as the ideal test case for Benneke's concept. The exoplanet tightly orbits a very small, dim star. Accordingly, the planet frequently crosses the face of its star from our vantage point, offering astronomers plenty of data points. Furthermore, the planet's transits block a relatively large amount of its host star's light, providing astronomers a stronger signal with which to parse its atmosphere. "GJ 1214b as the first test case is by far the easiest to do," said Benneke. "We will be able to learn something about the atmospheres of those planets, and from there if they have a surface or if they are just some kind of gas giant," said Benneke. "There have been a lot of theoretical ideas of what these planets could be that would explain their mass and radius, but there hasn't been really an explanation of how we can unambiguously distinguish between the two scenarios of super-Earth and mini-Neptune, until now."